An advertisement for Juul’s e-cigarette pods, including those flavored. On Tuesday, the San Francisco-based company announced that it would stop selling a majority of its flavored vaping products in retail stores. It also plans to shut down several social media accounts created to promote their products. Both decisions were made to curtail the popularity of vaping among teens. According to their announcement, as of this morning, the company has stopped accepting orders for its Mango, Fruit, Creme, and Cucumber flavors from more than 90,000 stores in the U.S. The flavors will be still sold through the company’s online store, but the company says that customers will have to undergo an age and identity verification check before being approved to buy them. To prevent others from buying the products in bulk and selling them elsewhere, customers will also reportedly only be able to purchase a certain amount of pods and devices per month. The company will, however, continue to sell two tobacco-flavored pods, as well as Menthol and Mint flavors—flavors also legally available in traditional tobacco cigarettes—in stores. The company will also tamp down most of its social media presence by getting rid of its Facebook and Instagram accounts. It will remain on Twitter, but the account reportedly won’t be used for promotional purposes. Juul’s decision didn’t come without its share of arm-twisting, though. Juul actually isn’t the first company to take these sorts of steps. In late October, the tobacco company Altria announced it would discontinue most of its flavored e-cigarette products, the New York Times reported. Given that Juul has captured close to 70 percent of the e-cigarette market in the U.S., according to Bloomberg, though, its decision is sure to send large ripples throughout the industry. But there’s still the question of whether these actions are too late, too little, according to Sven-Eric Jordt, an anesthesiologist and cancer biologist at Duke University who has studied the potential health risks of flavored e-cigarettes. It might not be the end of flavored e-cigarette products on store shelves, either. 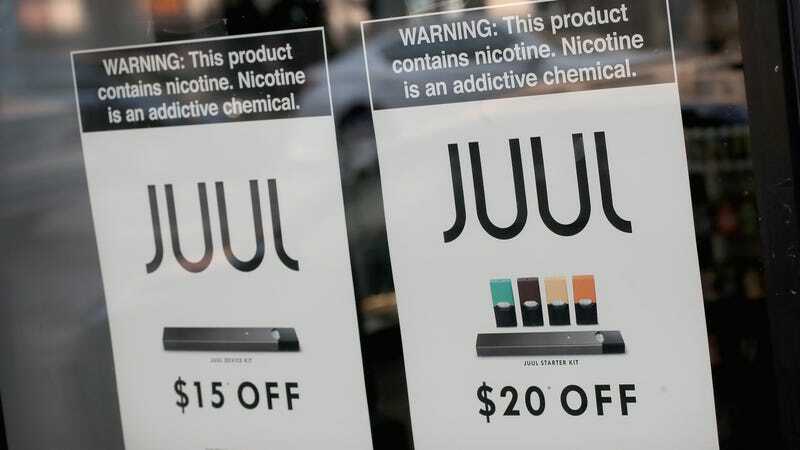 In its announcement, Juul left open the possibility of retail orders restarting if stores invested in technology that would restrict sales to people over the age of 21, including point-of-sale tech that would verify a person’s age through their government-issued ID. Altria has also stated that it would consider selling flavored e-cigarette products again, though only after getting FDA approval. Meanwhile, the FDA’s crusade against nicotine isn’t likely to stop at vaping. This past weekend, the Wall Street Journal reported that the agency is looking to eventually ban menthol-flavored tobacco cigarettes as well.